It is with great saddness to announce long time member,past president and club champion Ernie Rideout passed away on June 3, 2015 at the age of 97. Ernie was a regular bowler up until the past couple of years along with his wife Nancy whom he met here at the club. He was a man of immense talents and kindness we were lucky enough to call our friend. 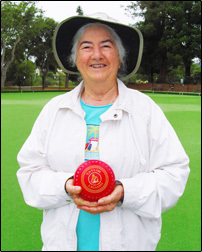 We were saddened by the sudden death of long time club member Doreen Evans on February 10, 2011. Doreen along with Andrew Pappin won the club pairs championship this past August. Doreen and her husband Graham hosted the club on their personal green for two years when our green was torn out and eventually replaced with the current synthetic surface. She will be greatly missed. 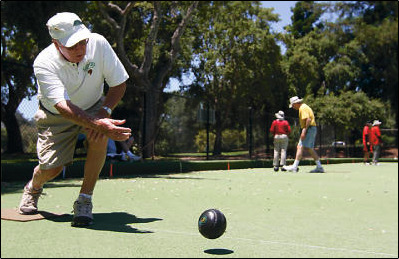 "Life In The Grass Lane"
Member Don Fitzgerald is shown delivering a bowl in the Santa Cruz Sentinel July 10,2011 article showcasing the club. Click here for the link. 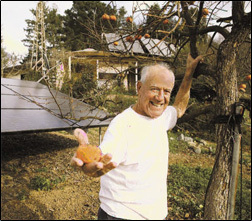 Member Harry Schoenfeld was featured on January 24,2011 in the weekly "Getting To Know" column of the Santa Cruz Sentinel. Click here for link. 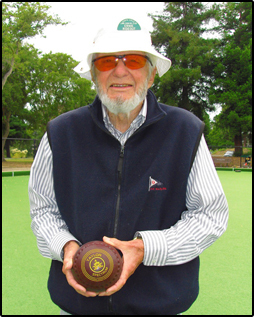 The bowls club itself was also featured the previous day.Click here for the full pdf file. 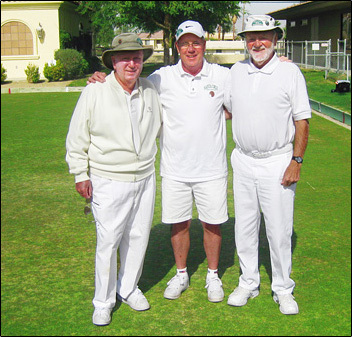 Santa Cruz was well represented in the Palm Desert International Sports Festival with Don Fitzgerald, John Lyons and Peter Blacklock participating. No medals were won, but Don Fitzgerald was in the finals for the bronze. Charlie Hebert won the gold medal and his wife Kathy won the silver medal. They had quite a match.